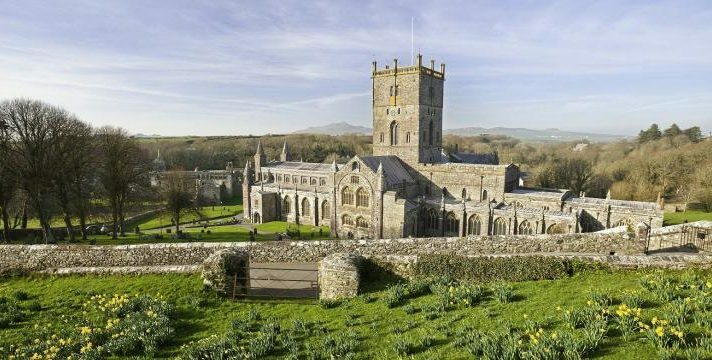 A new three-year project to rediscover the fascinating heritage of the early medieval saints, St David and his pupil St Aidan, has been announced by the Welsh Government’s Counsel General and Brexit Minister, Jeremy Miles. Led by Pembrokeshire County Council, in partnership with Pembrokeshire Coast National Park Authority, Wexford County Council and Visit Wexford, this cross-border project, funded by the EU to the tune of €1.9m, will drive forward economic growth across the two regions through regeneration, cultural and educational projects and business to business mentoring. There are plans for the restoration of St Non’s well at St Davids which is said to be the birthplace of St David, permanent artworks will be commissioned in both regions which will thematically correspond with each other. Schools will take part in a joint project to animate the story of the two saints, with pupils taking part in a visit to the partner country. St David, the patron saint of Wales, is commemorated in the city of St Davids, where he spent much of his life, whilst St Aidan is closely associated with Wexford, particularly in the town of Ferns. As well as enabling both communities to rediscover their shared heritage, the project aims to use this shared history as a way of attracting new visitors to these coastal communities. It is claimed St Aidan travelled from Wexford to Pembrokeshire to study under St David for several years. This mentor relationship inspired St Aidan to return to Ireland to build his own monastery at Ferns. Both Ferns and St Davids have historically important cathedrals, the cathedral at Ferns is the smallest in Ireland and the cathedral at St Davids being a key tourist destination. The Leader of Pembrokeshire County Council, David Simpson, said: “This has been a truly collaborative piece of work with a great many partners in the private, public and third sectors working with us throughout the application process”. This was posted on 25 January 2019.